I’ve taken many trips down the James River from Pony Pasture to Reedy Creek, but I almost always follow the normal paths that generally track the southern banks of the river. When the river levels are low, that is sometimes the only floatable path. Since the water levels in the James are a little higher than normal for late August, I decided to stick to the north bank of the river once I reached the James River Railway Bridge (AKA the Atlantic Coast Line Railway Bridge or Belt Line Bridge). I needed to explore a little and see the river and the scenery from a different angle. I’m often a guide for friends and family that have never been on the river, and I try to keep it easy, predictable and safe. I also find that I seek consistency and predictability in my life and sometimes it is good to break away from the routine. But when I kayak alone, I usually get a rush from trying the unknown of a new course, even if it isn’t a tremendous challenge. So with reluctance, I skipped Choo Choo Rapids, Cooper’s Rifle and Mitchell’s Gut – the prescribed path for most paddlers. I love that course, but I was pleasantly surprised by the little drops and tight runs between the rocks and trees along the way. Instead of shooting down Choo Choo, I took the channel through what used to be Grant’s Dam past the entrance to the Lower Canal. Someday the overgrown area where it passes under the CSX railway line on the north bank will be cleared all the way to the Pumphouse, giving paddlers access to the Kanawha Canal through George Washington’s Lower Arch and creating a new river access at the Pumphouse. I found plenty of scenery and views of the riverscape that were new to me. According to the Falls of the James Atlas by Bill Trout, much of the river in this section had been altered by man to create and maintain Grant’s Dam, which was built to direct water into the Kanawha Canal at the Pumphouse. I love the area between the Powhite Parkway and Boulevard bridges. It is so natural, wild and remote, yet right in the middle of the city. You can feel so free there among the honking geese and hunting osprey — only to hear an Amtrak train streaking its way across the arched railway bridge or a freight train roaring through the trees on either bank of the river. As I passed under the Boulevard Bridge along the north bank, it again occurred to me how isolated that section of river is, despite the thousands of cars that pass over that area every day by the bridge. Even though the area south of the CSX tracks is part of the North Bank Park, one would have to hike a long way to reach that area legally, due to the fences that block access along the tracks and the only allowed access is by the walkway tower at least a half mile down river. Creating an access at Pumphouse would form a needed second access and a loop to the trail. Plans for bike trails in the area are already in the works. At the end of the trip I’d collected more trash than normal — likely due to the fact that I’d taken the path less traveled by most everyone. 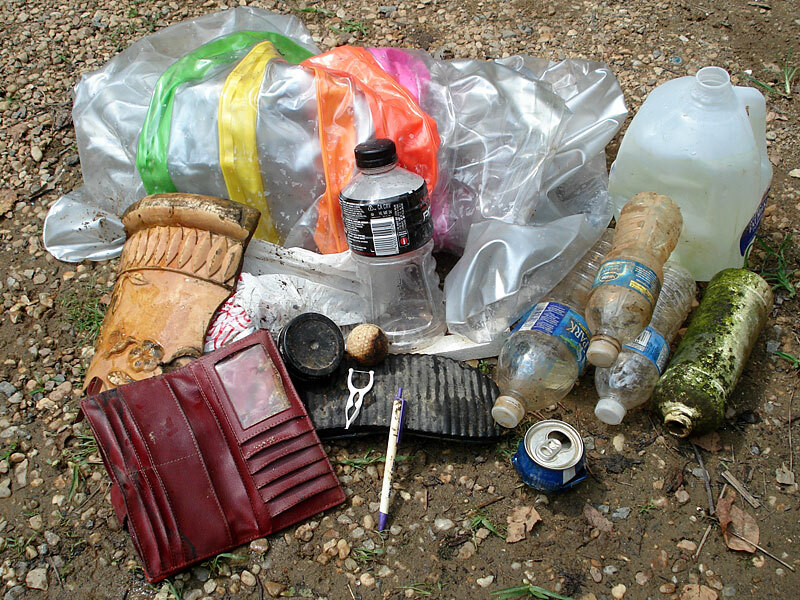 It was that much more satisfying snagging a few odd bits of river trash, like an inner tube and a broken piece of a styrofoam pot. Sadly, I also found an empty woman’s purse — a sign that not everyone on the river has the best intentions. 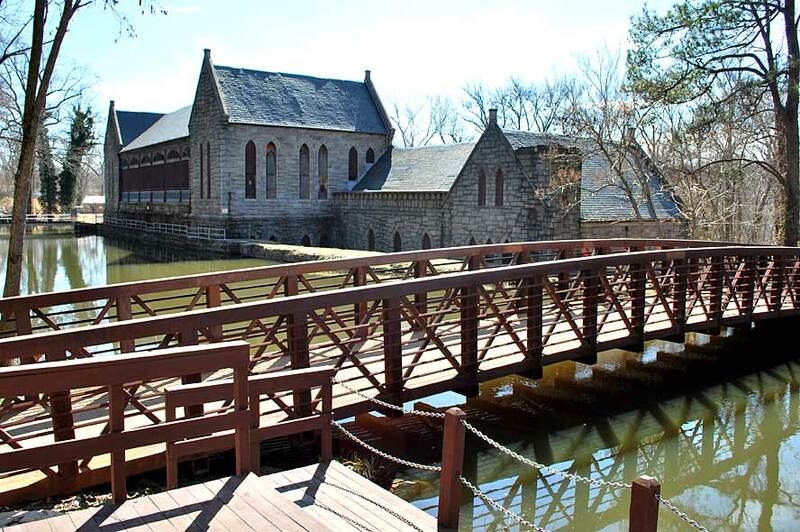 The City of Richmond is trying to bring back the glory of the Pump House. 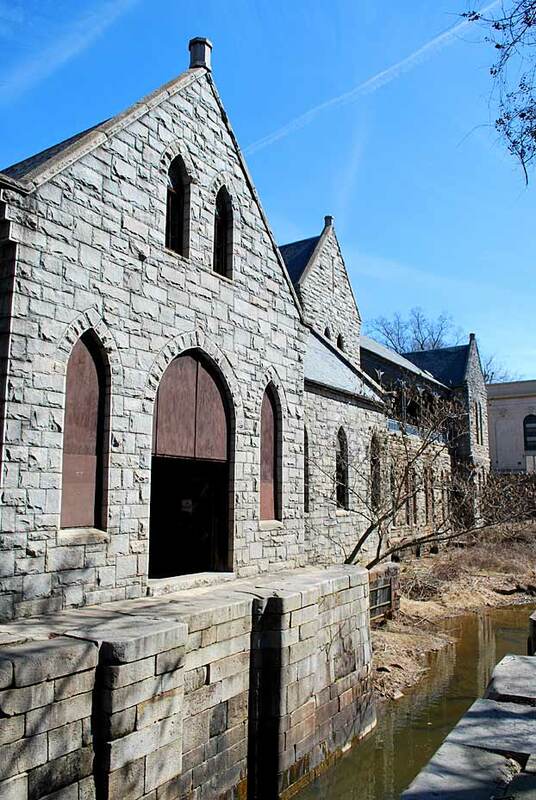 At a recent event at the old gothic treasure, parks director J.R. Pope talked with me about the plans for the Pump House, which was designed by the great Richmond city engineer Col. Wilfred Emory Cutshaw and built in the 1880s. 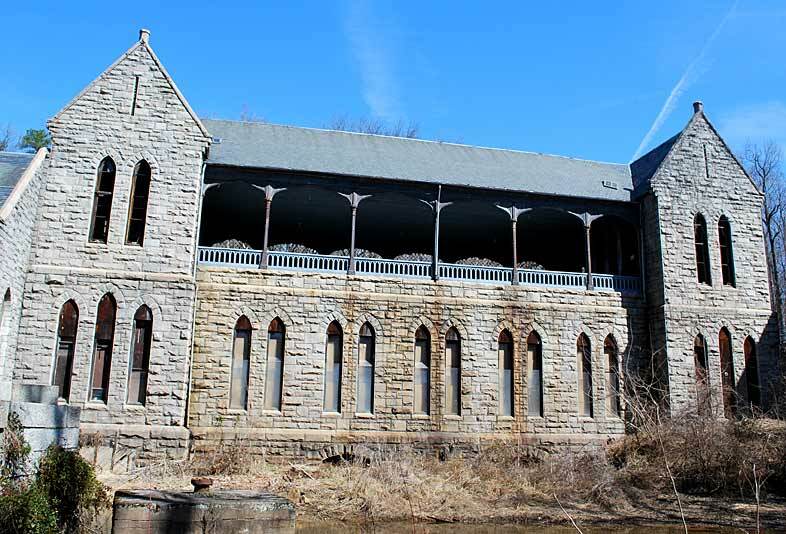 The gray granite Byrd Park Pump House is a magnificent example of the Victorian Gothic Style. 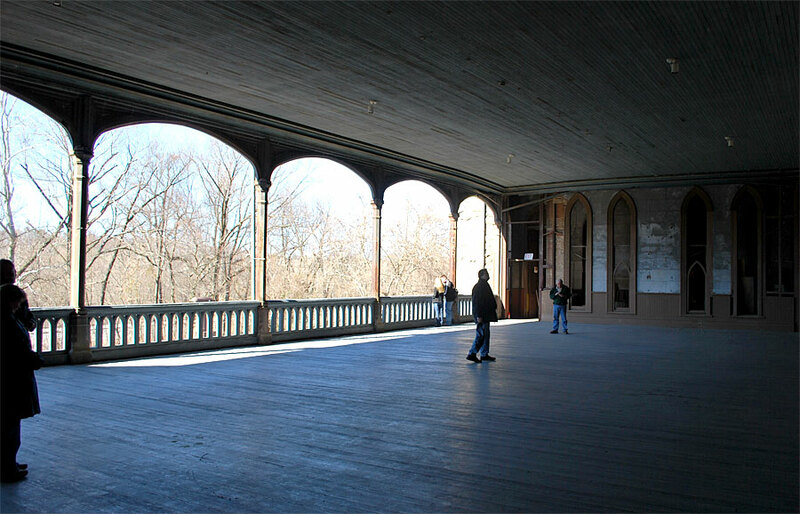 The upper floor, with cast-iron arches, was a pavilion used by park visitors…. [it] is a treasure well worth saving through re-use as a public meeting hall, part of a canal museum, a small restaurant and the terminus of canal-boat rides from downtown Richmond. It needs our help. 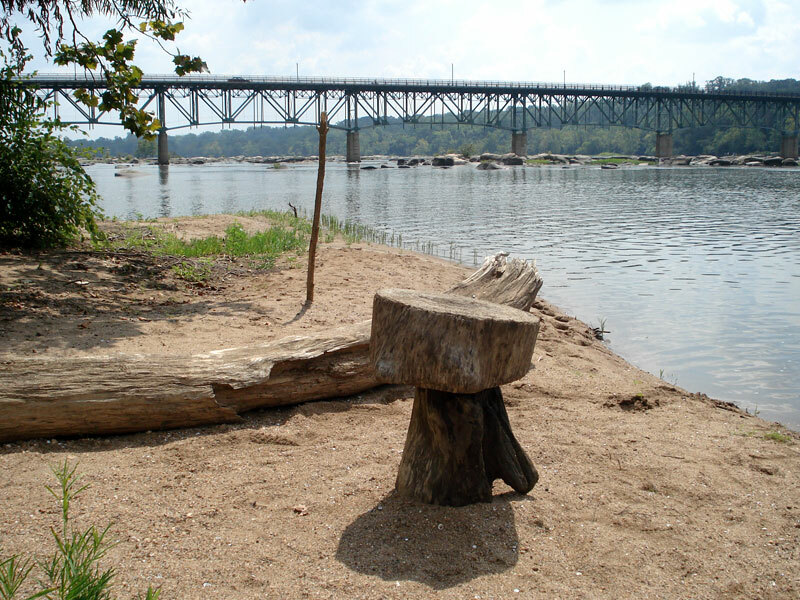 Pope and the Friends of the James River Park hope to make it reality someday soon. The hope is that it one day will be the new home for the James River Park System visitor’s center, Pope said. In addition, it could be a museum, learning center, host weddings, parties, events and the canal could once again be in operation. Of course, it would not be cheap, and fund-raising would be a big part of making that happen. I got my first look inside the Pump House, and it is a great space. I could see spots where Pope suggested an amphitheater could be placed. The building has space for offices, a gift shop, catering facilities — dream big, it might happen. The current state of the building is a little damp. Pope said that the canal would have to be drained and dredged. 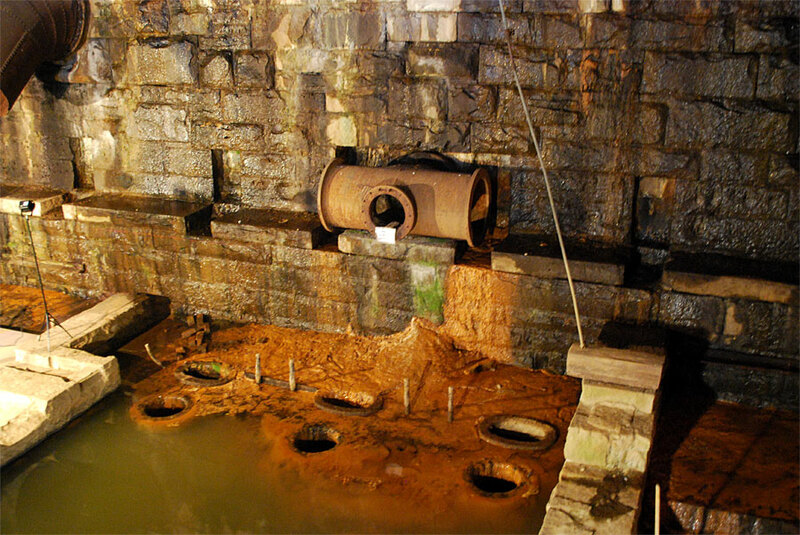 While the canal is dry, its leaky walls could be shored up to prevent the leaking that is seeping into the Pump House. Some areas of the main pump room are full-fledged springs and the room is constantly wet. He also lamented that the old iron pumps — the big machinery that filled the pump room when it was in operation — are long gone. They were sold for scrap to Japan in the 1930s. They would have been a great tool for learning about the old process and purpose of the building, as well as being something cool to see on a visit. The old dance floor — an open space with a balcony above the pump room on the top floor of the building — is every bit as alluring as I suspected. Standing there — after having read so much about the multipurpose usage of the building — I could easily imagine the grand parties held there in the early 1900s. People riding up the canal from downtown to the Pump House….maybe we can do it again someday? If not, at least experience a small measure of the building’s grandeur. Improvements to the access to the building have been made. A dock on the canal and a wooden ramp and staircase have been in place for a couple of years. The inside of the building has safe staircases and walkways and the structure is sound. Another giant step in the right direction is the recent work to clear the grounds west of the Pump House. Much of the weeds and unwanted trees have been removed. Plus, the Lower Arch — the grand entrance to the canal, famously visited by George Washington in 1791 — can finally be seen again. The building is more presentable to visitors — a large key to future fund-raising efforts that is not lost on Pope and the Friends of the James River Park. The building is stunning, but touring something so few people get to see inside is the real treat. As a news photographer, I get to see things like the Pump House in a more raw, more unfiltered state…There’s something vibrant about seeing a space sculpted into its intended purpose. There’s something beautiful about letting a place like the Pump House speak for itself. That would be the key to making the building work as a visitor’s center — not to alter too much of the character, which I trust Pope and park manager Ralph White would honor. 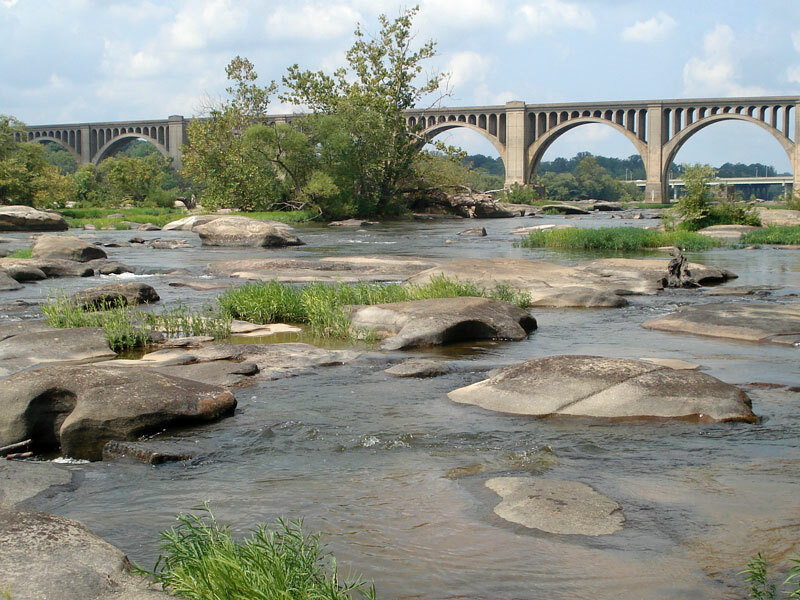 I’d love to be able to kayak from Huguenot Flatwater down to the James River Railway Bridge, left at Grant’s Dam and glide in under the Lower Arch before taking a break at the Pump House. We’d be able to paddle back out and ride down to Reedy Creek or beyond to finish our trip. 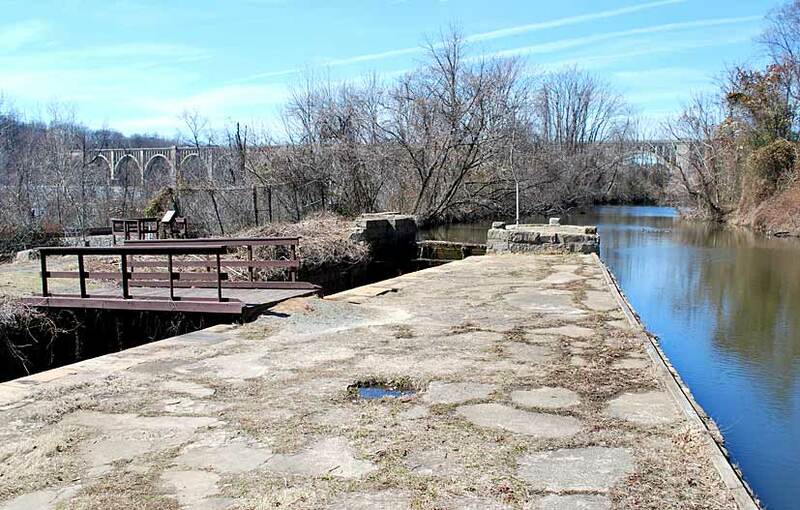 While we’re dreaming, how about being able to paddle back up from the current end of the Lower Canal, at Oregon Hill? [See two previous posts: Field research: Paddling up Lower Canal and Paddling up Kanawha Canal = Boon to Richmond?]. I recently wrote about paddling up the Lower Canal between Tredegar takeout (putting in canal at Hollywood Cemetery) and Pumphouse Park in Richmond. It could be done with some work if CSX granted permission, though my photos could leave some doubt due to a lack of water in the canal this fall. First, let’s ignore CSX’s rights to the canal. Second, let’s also ignore the low water levels in the canal. That isn’t the case year-round. The above image shows the canal just west of the end of the Lower Canal as it drops through a sluice at Dominion Virginia Power. The paddle from here is flat and scenic. The train tracks would be to your left the entire trip. After passing through wooded and secluded sections below the North Bank Trail and North Bank Park, the canal widens as it approaches Maymont. This trip was made by multitudes of Richmonders in 1800s as a means of travel headed west toward Lynchburg. 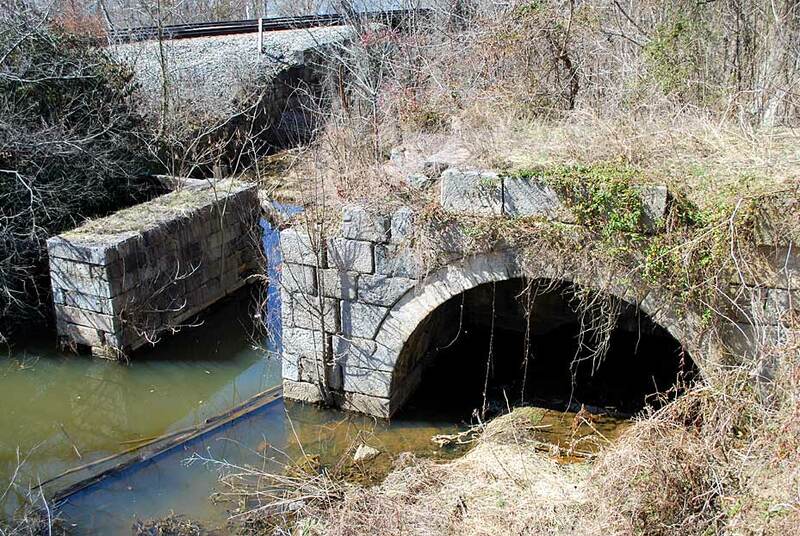 After passing Maymont, the beginning of the Lower Canal is nearby at the historic Lower Arch. This would be the end of the paddle before re-entering the James. George Washington himself famously visited the Lower Arch while it was under construction in 1786. Washington was honorary president of the James River Company that founded and built the visionary canal system. Lower Arch. There is an opening at left through the second arch, which is damaged. (Water is green in photo). Sad thing here, as illustrated by the above photo, is that the breach in Grant’s Dam (which provides us Choo Choo Rapids) cuts off the major supplier of water to the canal at the Pump House. It was nearly dry the day I visited, and quite overgrown. The area near the Lower Arch is cut off from foot traffic as it is CSX property. More study needed in this area. 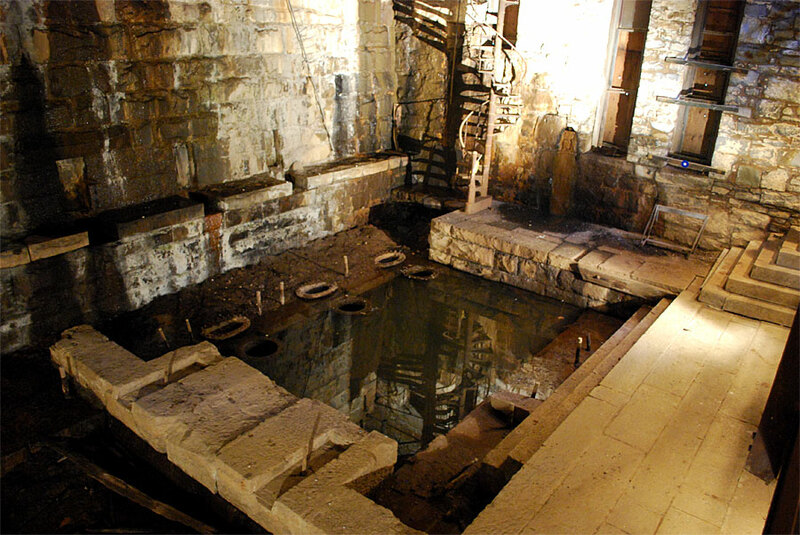 Through the Victorian age and into the 1920s, the trek west on the Lower Canal was made by city dwellers on their way to the Victorian Gothic-styled Pump House for dances and parties for the city’s elite. It would be great to relive that, even if it was just in a canoe or kayak (trading suit and tie for a PFD). The canal was also used to transport goods, including rocks from the many granite quarries along this stretch, including Maymont and the hillsides west toward Williams Island. The City of Richmond is trying hard to bring back the glory of the Pump House. It has been rumored that it one day may be the new home for the James River Park System visitor’s center. City of Richmond plans for canal rides at Pumphouse Park someday. I also know the plans seem to be slowly, slowly moving toward one day being able to take batteau or canal boat rides west from the Pump House on the Kanawha Canal toward the Powhite Parkway bridge and the Settling Basin, just below Windsor Farms. I’d love to be able to take my family on that trip around locks and under the James River Railway Bridge (my favorite man-made feature on the James). Most of my information on the history of the canal comes from the Falls of the James Atlas by Bill Trout and from park signage at Pumphouse Park. Paddling up Kanawha Canal = Boon to Richmond? 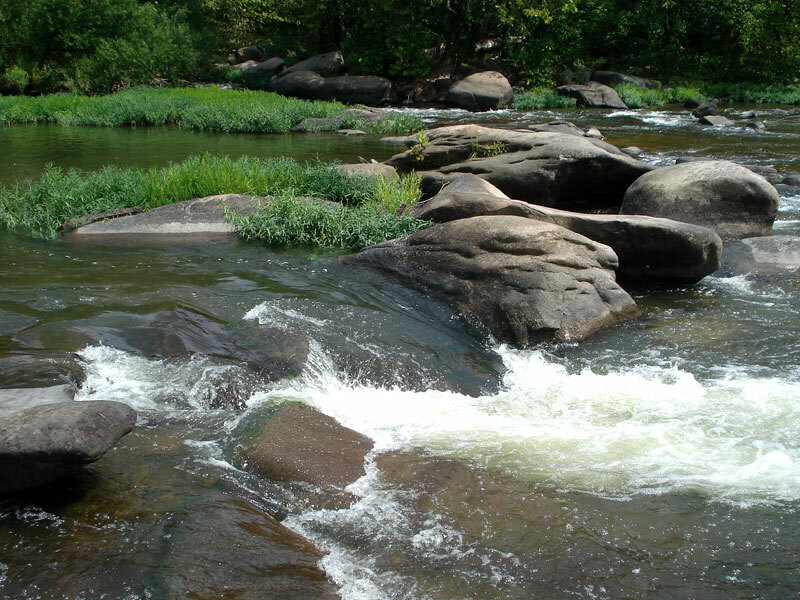 My son and I went for a paddle on the Appomattox River in Petersburg in summer 2008. I’d heard that you could park your car at Old Ferndale Park (or for greenhorns, Appomattox Riverside Park) and paddle up a canal for a mile or two, ride down the Appomattox and take out at Old Ferndale. A circuit! Great idea, and it worked like a charm. I really enjoyed the light workout and peaceful paddle up the canal, and got to see plenty of serene beauty and history, including the old towpath, a few ruins and remnants of the days when people shipped themselves and their goods by canal. Of course, the convenience of parking the same place you end up, with minimal portage or walking is ideal. It got me to thinking about doing this on the James river. Could we paddle up river on the canal in Richmond? The biggest problem is CSX rights to the canal and the busy train tracks. 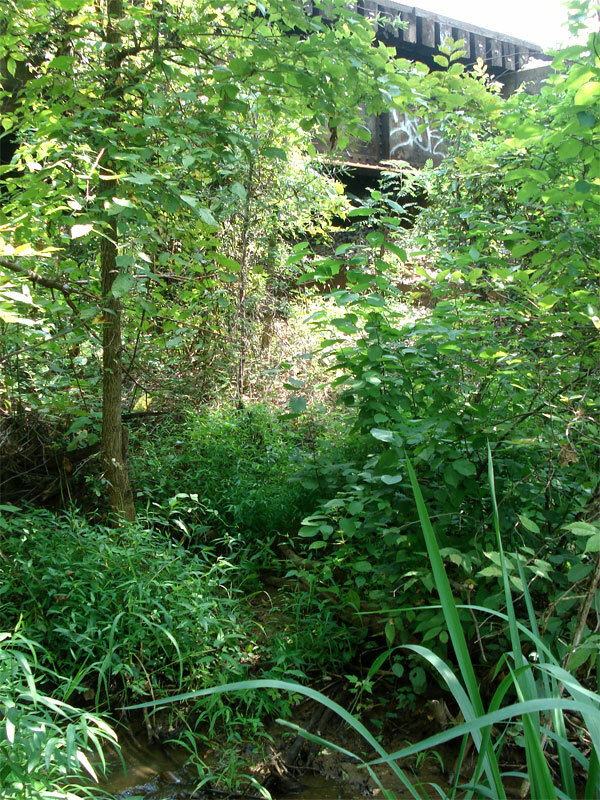 Legally, it would be a tough challenge, and CSX is very strict on property easements. Let’s skip all that for a moment. If you takeout at the Belle Isle pedestrian bridge on the north bank (or park there for starters), there is a long portage up the hill, under the Robert E. Lee Bridge and along the dirt path to the North Bank trail. Long walk, I know, but there is a reward. Just think of the scenery and excitement along that path. Yes, you can hike or walk the North Bank Trail, but what fun is that when you often can’t see the river or the train tracks. No one gets to see it but the CSX guys. I’d love to get a look at all that forbidden territory. In this circuit, you could hit Choo Choo Rapids, Cooper’s Rifle, Mitchell’s Gut, First Break, Approach and Hollywood before the takeout. I don’t have a huge circle of paddling friends that I shoot out ideas with all day, but of the individuals that I do know, most have said that would be a welcome option. People with high authority in city departments have commented that although it sounds nice, CSX wouldn’t allow it. One even said that the canal could be paddled all the way to Bosher Dam, almost the full distance of the Falls of the James. He even said the canal is in decent shape, except a few points could use some dredging due to property run-off and silting — a problem the good people on the Appomattox are trying to combat as well. Problem is, the tracks are built along the southern towpath of the Kanawha canal — the river side, in-between the canal and the river banks. There is little access to cross the tracks. Still, it could be done, and with little effort on CSX’s part. It works on the Appomattox because the land was granted to Petersburg by (then) Virginia Power. There are no train tracks to worry about, just a lazy tree-covered canal and relative peace and quiet. What, you don’t care for long paddles or long walks carrying your equipment? Fair enough, but there are plenty of people who do (including the paying crowd, ‘Adventure Games’-type people), and plenty of cities that aren’t as lucky as we are that we have so many glorious access points to a river like the James. Even more important to acknowledge is the fact that we have this fantastic wild river with up to Class IV rapids right smack dab in the middle of our fair city. Most people have to drive hours to get rapids like we have, and park in tiny crowded lots or camp overnight or go with a tour group just to get on the river.